Buses pick up at Manzanita every 30 minutes, at approximately :07 and :37 minutes after the hour, starting at 4:07 AM until 11:07 PM. The trip to SFO usually takes a little less than an hour, but may take longer depending on traffic conditions. The bus picks up at the bus pad located in the Manzanita Park & Ride lot underneath the freeway at the Hwy 101 & Hwy 1 split south of Mill Valley. There is no long term parking available at this location. 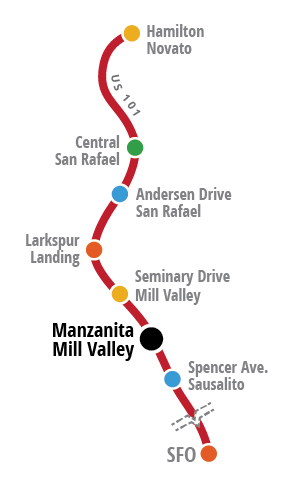 Manzanita is a CalTrans Park & Ride lot with a posted maximum parking limit of 24 hours. Due to the high tides that are resulting from this week’s “super” full moon, it is likely that CalTrans will close the Manzanita Mill Valley parking lot. As a result, we will not be able to pickup or drop off passengers there. In the event the lot is closed, please catch the bus at either the Seminary Drive, Mill Valley or Spencer Ave., Sausalito. stops. Click here for more info, thanks!